I've been getting ready the past couple of days for a possible workshop on Sunday. Possible because it was sort of a last minute thing. I had some friends that were coming that needed to cancel ... but the one friend that was still available, has some friends that would like to come if their calendars are free. I'll find out tomorrow if it's a go ... or if it's just going to be a small number and, therefore, more casual and less structured. The good thing is that I'm ready with a new class of cards for these ladies when their schedules gel (if not this Sunday). All materials for this card are from SU! Hope you like. 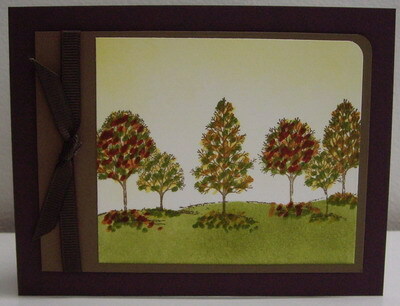 "Autumn Lovely as a Tree"
I stamped the trees in Soft Suede ink onto Whisper White cardstock. I stamped the image again onto a post-it note to use for a mask. I cut out the post-it note along the "hills" and masked the sky. I added fallen leaves on the ground at the bottom of the tree trunks, using Stampin' Write markers. I sponged the rest of the grassy area with Old Olive and then removed the mask. I added leaves to the trees, again with the Stampin' Write markers. I sponged the sky with Daffodil Delight and then used the corner rounder to round off the top right-hand corner. I mounted the main image onto a frame of Soft Suede that was 1" longer (also with the top right-hand corner rounded). I wrapped the Early Espresso ribbon around that extra margin of Soft Suede and tied a knot. I secured the knot in place with a glue dot. I mounted the main image panel onto the card base of Early Espresso, popping it up with dimensionals to add depth. Labels: colouring with markers, masculine, Stampin' Up!